Unfortunately Oh The Sea that would have started on June 2nd 2016, is cancelled by the Stadsschouwburg. Shortly before starting they came to the conclusion they were not able to handle all the logistics of the project. 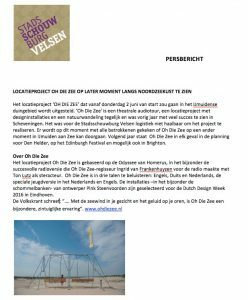 Beneath the press release of the Stadsschouwburg (in Dutch though). We will be back in 2017 in Den Helder and possibly the Edinburgh Festival and even Brighton.